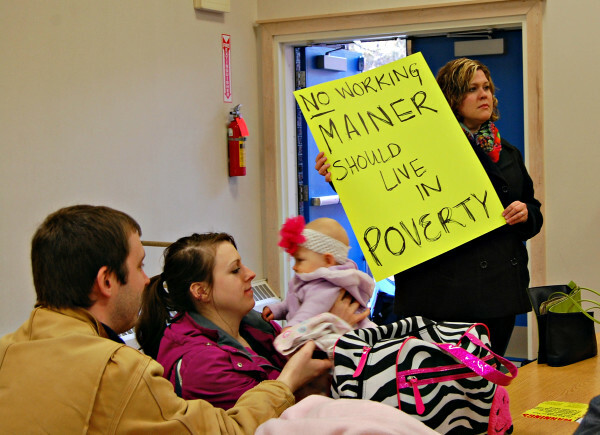 Supporters of raising the minimum wage attend an April 2015 meeting hosted by Bangor Councilor Joe Baldacci at Abraham Lincoln School in Bangor. PORTLAND, Maine — The Bangor Chamber of Commerce shared details Friday of the smaller minimum wage increase that business groups hope to place before voters in November as an alternative to a progressive group’s proposal to raise Maine’s minimum wage to $12 an hour by 2020. The business group’s competing proposal would incrementally raise the state minimum wage to $10 an hour. The Maine People’s Alliance submitted a citizen’s initiative to increase the minimum wage of all Maine workers, including tipped workers, to $12 an hour by 2020. Organizations representing businesses in Maine — particularly restaurants and innkeepers — say that would be catastrophic for their industries, but a spokesman for the Maine People’s Alliance called their effort a “cynical attempt” to subvert a referendum backed by tens of thousands of Mainers. Rep. Stacey Guerin, R-Glenburn, told the Bangor Daily News on Thursday that she plans to sponsor the bill to put the competing measure on the ballot, but supporters provided few details Thursday. Greg Dugal, executive director of the Maine Innkeepers and Restaurant associations, said the group would reveal the proposal at a press conference Tuesday. However, in a statement issued Friday, the Bangor Chamber said the competing proposal would ratchet up the minimum wage by $1 in 2017, to $8.50. It would move up 50 cents each subsequent year until reaching $10 in 2020. In a much-sought change by the restaurant industry, the proposal would also preserve a “tip credit,” which allows employers to pay half of the state minimum wage to tipped workers and then count any tips toward total pay. If the combination of those two sources doesn’t amount to the minimum hourly rate, the employer must make up the difference. The business groups’ proposal also would not include automatic increases to the minimum wage after 2020. The MPA proposal indexes increases in the minimum wage to inflation after hitting $12. A coalition from the Maine State Chamber of Commerce, the Maine Innkeepers and Maine Restaurant associations and the Retail Association of Maine pitched the concept of a competing question on the ballot to more than a dozen legislators during a Thursday lunch at The Gin Mill in Augusta. The Maine Legislature still has to consider the Maine People’s Alliance proposal, but it only has three options: It can pass it along to voters, enact it by itself or place it and a competing measure on the ballot. If legislators choose the latter option, voters would have three options on the ballot — the $12 proposal, the $10 proposal or neither. If neither measure wins a majority vote, but gets at least the support of one-third of the electorate, the leading measure goes to a runoff election within 60 days. Competing measures are rare. One hasn’t been on the Maine ballot since 2003, when voters mandated that the state pay 55 percent of K-12 education costs. Maine’s most notable competing measure campaign in recent history was on clearcutting in 1996, and it caused considerable confusion among voters. Maine’s minimum wage is now $7.50 per hour. Portland enacted a municipal minimum wage increase that took effect Jan. 1., and Bangor passed its own measure due to take effect in January 2017. Maine People’s Alliance spokesman Mike Tipping called the competing effort a “cynical attempt” to stop his group’s referendum, noting that the business groups have opposed past minimum wage increases. State House reporter Michael Shepherd contributed to this report.